As predicted by Pasquale Tricarico on the Minor Planet Mailing List in message 27642, NEO 2012 XE54 was eclipsed by the Earth's shadow during its close approach to Earth on 11 December 2012, a relatively rare event. More information from Pasquale here. 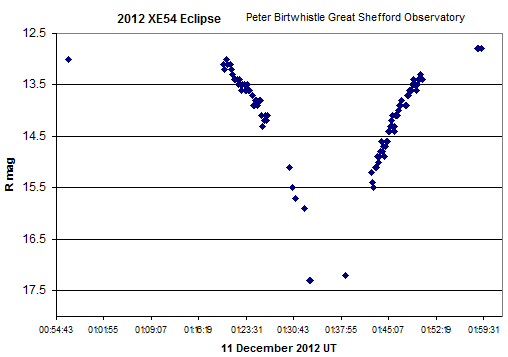 A very preliminary lightcurve of the eclipse as measured from images taken at Great Shefford Observatory is given below, with the details subject to revision later. The measurements are from individual images apart from the points at mid-eclipse, measured from stacks of multiple images.